REDUCED to almost $2.5M FROM ORIGINAL ASKING PRICE! The ultimate expression of Southern California living, where classic meets coastal, where traditional & modern are naturally entwined, this meticulous estate in Orange County+GGs preeminent luxury enclave -Crystal Cove- offers resort style living at its finest. With views of the Pacific Ocean & its majestic sunsets, this nearly 7,700sqft property offers beautiful & refined details throughout, creating a timeless interpretation of classic design & style. Generously appointed with 4 bedrooms & 6 bathrooms including dual master suites, the spacious floor plan opens to patios, courtyards, & terraces that capture ocean views. The amenities & rich materials include handsome stone and brickwork, custom ironwork, white solid oak flooring, antique glass, lutron & pendant lighting throughout. The professional kitchen features Italian & Calacatta statuario marble counter tops, hood surround, Sub-Zero refrigerator, & butler+GGs pantry. The basement level promises memorable entertaining with media room, wet bar, wine cellar, & fitness room. Upstairs, the master suite has an extraordinary walk-in closet & dressing room with envious ensuite bath. Tranquil & private thanks to its prime location on the 2nd smallest street in Crystal Cove, the grounds include a pool, spa, outdoor bbq & fireplace, ideal for entertaining. 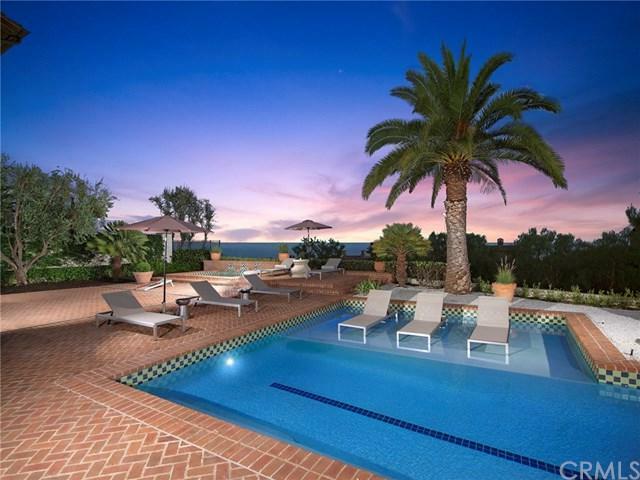 Other highlights include elevator, smart home technology, & world-class Crystal Cove amenities.